Due to the effects of traffic loading, weather assaults, and common aging, all pavement structures will eventually wear out. When the time has come to address failing asphalt pavement, common maintenance approaches have been to perform full depth repairs of the asphalt or to perform an asphalt overlay, or a combination of the two. 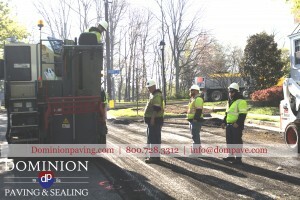 An asphalt maintenance procedure that has been slowly gaining popularity since the mid 70’s called Full Depth Reclamation (FDR) is an alternative to consider versus the standard practices of repair and overlay. The FDR process uses the existing asphalt and underlying base material, with an addition of different types of additives (Portland cement, fly ash, lime) and builds a strong, durable base for a new asphalt overlay of 1.5 to 2 inches in depth. In simple terms, the existing asphalt and a predetermined portion of the underlying materials are pulverized, mixed with a predetermined additive, and then are compacted. The result is a stabilized base for a new pavement structure. When utilizing the FDR process, there is no need to haul into the site new aggregate for a base, and naturally no material is being removed off site to overcrowded landfills and asphalt plants. The new stabilized base structure will stand up to heavy traffic loading, which reduces maintenance costs and prolongs the life of the pavement structure. In addition to providing an environmentally accepted approach to asphalt rehabilitation, reclamation offers significant cost savings compared to full depth asphalt repair and undercutting of sub-base material. Conserves energy – it is completed in-place so trucking and other material handling items are eliminated or reduced. Reflective cracking eliminated – existing cracked pavement is pulverized and will not reflect through the new overlay. Long-term cost effectiveness – the cause of many pavement failures, a weak sub-base, is addressed and corrected. Roadway crowns or surface drainage issues can be addressed and either maintained or corrected during the process. Future maintenance costs are reduced. Although FDR is a great asphalt rehabilitation alternative, the use of the practice may not be practical for some sites due to the size of the equipment. The FDR process is an option for most roadway or drive lane areas, as well as parking lots of significant size with limited islands and a few tight corners. Dominion Paving performed reclamation at the Loudoun County Transportation Facility in Leesburg, Virginia. The parking lot in this case was a fenced wide open lot with limited islands in the 30,000 square yard range. 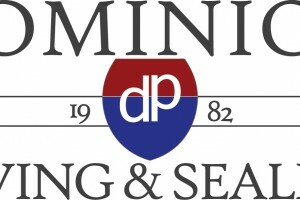 In addition, Dominion completed approximately 15,000 square yards for the General Shale Brick Company in Manassas, Virginia, on a parking area and drive lanes with limited obstructions. 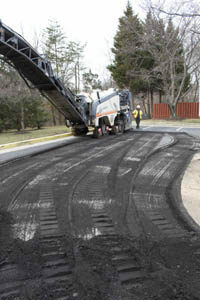 Full Depth Reclamation is one of the fastest growing asphalt rehabilitation techniques being utilized world-wide. FDR has proven to provide quality results at substantially lower costs than typical remove and replace scenarios, especially on projects requiring replacement at a 6 inch or more depth. As budgets get tighter and pavement owners search for more cost effective ways to repair or replace asphalt, Full Depth Reclamation may be an alternative for sites compatible with the equipment required.